Having volunteered for YoungLives Huntington Beach since the spring of 2012, I had had the opportunity to participate in the Christmas club event of 2012 and knew what to expect this year: The story of Jesus’ birth, gifts for each mom, and the opportunity to “shop” for both mom and baby in our “Christmas Boutique” was in store. 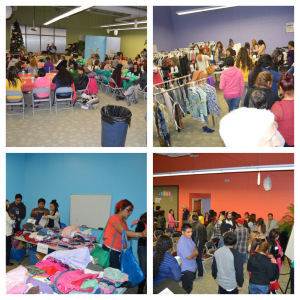 A few days before club, as other mentors and I sorted through and organized seemingly endless amounts of donated clothing items in preparation for the 2013 Christmas Club, I couldn’t help but get excited to see the faces of the teens we serve when they claimed these wardrobe pieces as their own. Christmas Club of 2013 has recently come and gone and I have such a full heart with memories of the events that took place and the clear knowledge that God’s hand was ever present in each aspect of the evening. Club started with volunteers serving us a (delicious!) meal that they had graciously prepared. To see the teens be waited on in this way was such a blessing. After a time of feasting and fellowship, the children were signed into childcare and the teens and mentors together sat for a time of worship, followed by a brief message: our “Club Talk.” Colleen, a YoungLives volunteer and committee member, shared with us her own testimony of coming to Jesus. She shared with the teens that as she was a mother of young children when she accepted Christ, she essentially learned the Bible with her children, while reading a children’s version of the Bible to them. As a gift of encouragement, each young mom received her own Children’s Bible, with the prayer that they will both read the word of God to their children, and plant the word in their own hearts. Next on the agenda was the boutique! Each mom was given a pack of diapers, a pack of baby wipes, and thirty tickets to spend on boutique items (1 ticket per item) for herself and her child. To see the looks on the faces of the moms as they entered the boutique rooms was enough to bring tears to my eyes. These girls were not just given clothes for their children to wear; they were given the opportunity to “shop” for them: to feel pride in providing their babies what they need. They were given the opportunity to put a gift under the Christmas tree for their children that they otherwise would not have had the means or opportunity to do so. Likewise they were not just given clothing and accessories for themselves; they were given a chance to be carefree, of cost or otherwise, while they browsed the racks and filled up their bags. They were given a chance to feel beautiful again in a body that has been transformed by pregnancy. They were given a chance, if only for a moment, to just be teenage girls again! The teens left that night with gift cards, diapers, wipes, overflowing bags of clothing, and Children’s Bibles. But more importantly, they left with the knowledge that they are worthy of being served. They left knowing that the Lord can work through them as disciples, while working on their hearts as children of God. They left with a sense of pride in their appearance and a sense of independence as providers for their children. They left knowing that they are loved.